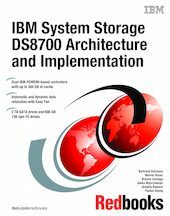 This IBM® Redbooks® publication describes the concepts, architecture, and implementation of the IBM System Storage® DS8700 storage subsystem. This book has reference information that will help you plan for, install, and configure the DS8700 and also discusses the architecture and components. The DS8700 is the most advanced model in the IBM System Storage DS8000® series. It includes IBM POWER6®-based controllers, with a dual 2-way or dual 4-way processor complex implementation. Its extended connectivity, with up to 128 Fibre Channel/FICON® ports for host connections, make it suitable for multiple server environments in both open systems and IBM System z® environments. If desired, the DS8700 can be integrated in an LDAP infrastructure. The DS8700 supports thin provisioning. Depending on your specific needs, the DS8700 storage subsystem can be equipped with SATA drives, FC drives, and Solid® State Drives (SSDs). The DS8700 can now automatically optimize the use of SSD drives through its no charge Easy Tier feature. The DS8700 also supports Full Disk Encryption (FDE) feature. Its switched Fibre Channel architecture, dual processor complex implementation, high availability design, and the advanced Point-in-Time Copy and Remote Mirror and Copy functions that incorporates make the DS8700 storage subsystem suitable for mission-critical business functions.